Pictured above from left to right: Gina Teegarden, Rebecca Gammon, Michele Apker, Cheryl Cournoyer (back), Erica Szczepkowski (front), Marcia Swasey, Jeannie Kellogg (back), Christopher Raphael (back), Ilia Echevarria (front), Dora Krauss, Susan Kimper, Margie Arnold, Jennifer Stanley (back), Lori Lupe, Christina Carranza, Chitra Paul Victor. 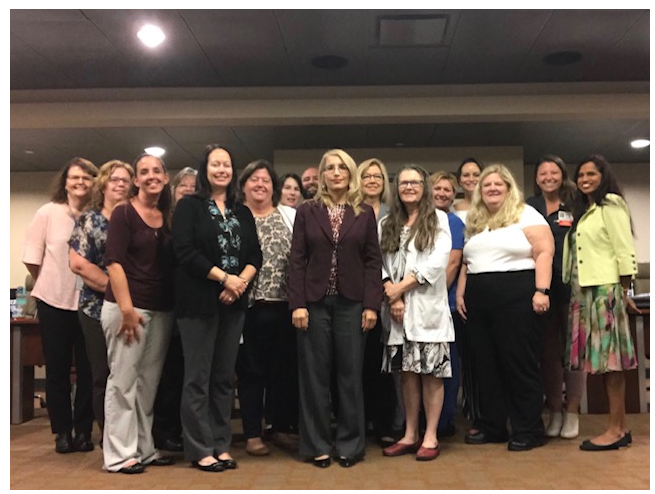 The Mission of the Southwest Florida Organization of Nurse Executives (SWONE) is to support the advancement of healthcare and nursing in Collier and Lee counties through professional networking, education, mentorship, and consultation. Our vision is to be recognized as one voice of nursing leaders at all levels advancing healthcare at the regional and state level. Collaborating with the Florida Organization of Nurse Executives to support mutual goals, objectives, and strategic plans. Providing opportunities for ongoing networking and communication among nurse leaders and aspiring nurse leaders. Supporting the leadership development of professional nurses. Advocating for health policy issues that affect nurses and the public. Seeking ongoing expansion of our Chapter to ensure representation of all practice settings. Ensuring activities of the Chapter are visible in our agencies and in our community. Providing education and mentorship opportunities for advancing the knowledge and skills of our members. The roster of 2019 SWONE Officers will be located in the Members Only Document Library.